Chasing Motherhood: "THE HAMSTER WON'T DIE"
I have a vivid memory of watching Saturday morning cartoons as a six year old. On this particular morning, I sat amongst a few children, all of whom laughed wildly as the escapades unfolded on screen. I sat there, silent. Not a peep. Now don't get me wrong...I find LOTS of things funny, very funny: I am an avid SNL fan, could watch The Hangover on repeat, and semi-worship Judd Apatow. I am also a huge believer in the power of laughter. I am still, however, acutely aware after all these years, that it is rare that something makes me actually laugh out loud. Cue Whitney Collins. 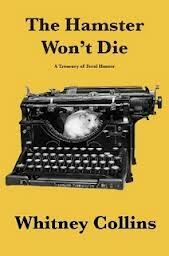 Her recently published adult-eyes-only collection "The Hamster Won't Die" is my kryptonite. For Whitney (creator and editor of two humor websites: Errant Parent and The Yellow Ham) humor has always been her forte. We reconnected post-college thanks to Mark Zuckerberg, and her status updates alone are reason enough to log on. And it seems the words of the late, great Nora Ephron, "Everything is copy", applies directly to Whitney's life. "For example, I would have appreciated knowing that administering oral medication to an infant was about as easy as inserting a rectal suppository into a hummingbird. I would have also like to have known that bathing a baby was like trying to wrestle a greased eggplant from Lake Superior. And in lieu of a sterling rattle, I would have much preferred the gift of blatant honesty. Why didn't someone tell me that diapering a baby boy was the equivalent of folding an origami crane while someone urinated in my mouth?" Q: HOW OLD WERE YOU WHEN YOU DISCOVERED THE POWER OF WRITING? Q: HAS HUMOR ALWAYS BEEN YOUR VANTAGE POINT? IF SO, WOULD YOU EVER EXPLORE ANOTHER? A: There was a time in college, when I was majoring in Fiction, where I tried to write really deep, overly wordy, ambiguous short stories. The humor, however dark, kept peeking through. I really tried to suppress it. I thought it was a sign of weakness. Even through a brief stint in an MFA program, that I eventually dropped out of, I thought humor was cheap or unintelligent. Finally, I just came out of the comedic closet and said: I don't really want to write about depressed a-holes. I want to make some poop jokes. Q: HAS PARENTHOOD CHANGED YOUR WRITING? A: Parenthood has changed everything. It's what has brought me back to full-on humor. Before my first son was born, I was dabbling in humor writing, but had not fully embraced it as my calling, so to speak. Then my son got colic, and for six months, my life consisted of listening to my child inconsolably scream. In a scenario like that, you either start finding humor or you start finding heroin. Q: CAN YOU SHARE A BIT OF YOUR WRITING "ROUTINE" AND HOW YOU CARVE OUT THE TIME? A: My routine. Well, as most people know, I love Facebook, and more recently, Twitter (@theunpoet). These two outlets give me a forum for quick one-liners and observations. So, it's kind of like writing throughout the day. Sometimes a tweet or status update will later lead to an essay or poem or humor piece. But my true routine happens on Monday, Wednesday, Friday. That's when my almost-2-year old goes to a Kid's Day Out Program from 9-2. I only write then. I don't run errands or do laundry or clean or catch up on correspondence. I try to force myself to write from 9:30-1:30, three times a week. Q:WHAT WAS THE PROCESS LIKE TO SELF PUBLISH? A: Self publishing is awesome. It used to be expensive, now it's $75. They only print your book when someone orders it, instead of you getting stuck with 1,000 copies in your garage. I chose Lulu.com for self publishing. My book can be bought through Barnes and Noble or Amazon. Having supportive friends and family has been crucial. But honestly, I really haven't published to make some big debut. I was just turning 40, had a bunch of comedic crap compiled, and truly thought the world was ending on Dec. 21. That motivated me. The thought of the entire world in flames and everyone around me screaming helped me throw a little prose together. Q: WHO ARE YOUR ICONS? A: Oh, those dear people I worship. Let's see: Tina Fey, David Sedaris, Amy Sedaris, Lena Dunham, Dave Barry, Erma Bombeck, Flannery O'Connor, Kate McKinnon, Kristen Wiig, Louis CK, David Spade. These are funny, brave people for whom looking foolish is not an issue. The joke, even the darkest and dorkiest joke, always comes first for them. I love people who don't worry about what others think. They just worry about delivery. Beyond the super-famous people I admire, I really love and am inspired by my funny kids and husband and Facebook friends, particularly Mary Laura Philpott, JD DuPuy, Cary Howard, Dan Burt, Monique Alice, Sissy Gardner, Cindy Gold, Amy Rodriguez and Meredith Bland. Those folks are really hilarious. Their banter is a daily delight. "FOOD CRUSH: THE PIG AND THE FIG"